The money will enable the charity to buy a new puppy and will help towards the costs of its training. The trained Ability Dog (after two years of training) will provide assistance to a disabled young person on the Island. Ability Dogs help young people with physical and mental disabilities, including cerebral palsy, autism, diabetes and epilepsy. 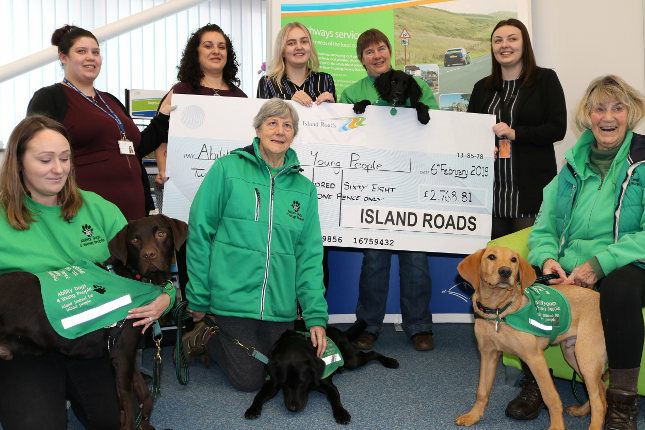 By assisting with practical tasks such as picking up items, opening doors, helping dress and undress and crossing the road, trained Ability Dogs help increase disabled young people’s well-being, confidence and self-esteem, enabling them to go on to further education or gain employment without needing full-time carers. “We are delighted with the total raised which is the most we have collected in a single year. It shows just how much of a chord the charity struck with staff.